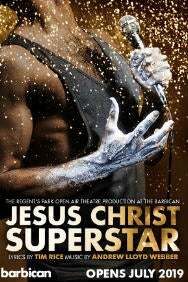 Lyrics by Tim Rice and music by Andrew Lloyd Webber The multi award-winning production of Tim Rice and Andrew Lloyd Webber's Jesus Christ Superstar is back. Playing just 60 performances at the Barbican following two sell-out seasons at Regent's Park Open Air Theatre, this "gorgeous, thrilling, heavenly musical" (Guardian) is "an almighty revelation" (Daily Telegraph). Clearly sign-posted, with 4 car parks (2 off Beech Street with westbound access only; 2 off Silk Street near the main entrance). To use your sat-nav to locate the car parks, enter EC2Y 8DS as the post code. Book via the Box Office on 020 7638 8891, for discounted rates. After booking, you will be sent a parking voucher. Barbican car parks operate a pay-on-foot system. For card payments, instead of taking an entry ticket, simply insert your card into the barrier on entry and again on exit. Your card will automatically deduct the correct amount. Blue badge holders can obtain a free parking voucher by presenting their blue badge at the Box Office/ticket desks. Wider accessible bays can be found in Car Parks 3 and 5. These spaces can be booked by calling the Box Office on 0845 120 7500. Coaches can drop off and collect passengers in Silk Street, with limited coach parking in metered bays in both Silk Street and Fore Street. Please Note: Moorgate Station will experience some disruption from the Crossrail engineering works until late 2016. MOORGATE STATION: The two escalators between the Great Northern platforms and the Northern line platforms will be taken out of service, one at a time from Saturday 29 March until December 2015. While each escalator is out of service, the remaining escalator will run up from the Northern line to the First Capital Connect platforms. Customers going down to the Northern line will only be able to do so via the spiral staircase at the end of platform 10. During peak hours customers entering the station will only be able to access the Northern line via the stairs and the spiral stairs from the ticket hall. provides up to the minute travel options on how to reach the Barbican quickly and accurately. Alternatively, you can call London Travel Information on 020 7222 1234. The Main entrance at Silk Street is ramped and lifts give access to all levels. All our venues have seating for wheelchair users - please inform us of any access requirements on booking. There are three wheelchairs for visitors' use, subject to availability; these can be pre-booked by calling the Box Office on 020 7638 8891. An induction loop is provided in the Concert Hall and Cinema. Visitors with hearing aids can make use of this facility by switching their hearing aid to the 'T' position. A radio network system is provided in the Theatre and Pit - visitors with hearing impairments may benefit from this facility. Headsets can be collected from Theatre Stalls Right prior to performance. Assistance dogs may be taken into the auditoria or left with a member of staff. Adapted WCs are provided on Levels -2, -1, G, 1, 2, 3 & 4. Cash/ATM – there is a Lloyds cashpoint on Finsbury Pavement, approximately a 6 minute walk from the Barbican. Eating – whilst there are a wide selection of places to eat/drink within the Barbican, there are also a number of bars/restaurants in the area around the Barbican. The Jugged Hare is a gastro pub on Silk St; Chiswell Street Dining Rooms offer modern British cuisine; Wagamama and Bad Egg are both on Ropemaker Street. Drinking – Red Lion pub on Eldon St, or Costa Coffee on Ropemaker Street. There are 3 restaurants, Barbican Foodhall on the ground floor; Barbican Lounge on the1st floor and Gin Joint on the 2nd floor. Something for everyone, something for all budgets and all occasions. All the Barbican restaurants use Fairtrade food where possible. Specialising in London Dry Gin, our extensive cocktail menu offers exceptional cocktails that will convert the most ardent vodka fan. A selection of nibbles, sliders, and lighter dishes are available to order from the Bar as well. Each evening from 5–8pm we give our guests a chance to try out any of our fabulous London dry gins for the price of £7.50 - it's a democracy! Please note these opening times are subject to Barbican events and may vary, please check with the Barbican direct. You can access our fast and free Wi-Fi network in the foyers. Upgraded in 2012, the new network speeds are faster than a typical home broadband connection. To access the network, switch on your WiFi device (smartphone, tablet, or laptop) and ensure that WiFi is enabled. Select 'The Cloud' from the available network list, and open your internet browser. You will see The Cloud landing page. First time users can follow the simple one-time registration process, otherwise you are prompted to log-in and can begin using the Wi-Fi service. A free cloakroom service is available immediately prior to performances. Our main cloakroom on the Stalls floor (Level -1) is open from 5.15pm until 30 mins after the event on performance days. Opening hours can vary depending on our event programme. Alternative cloakroom facilities are also available outside the Barbican Art Gallery on Level 3 during exhibition hours. For your comfort and safety, all large bags and packages are required to be deposited in our cloakrooms before taking your seat. The Barbican Library is the City of London's leading public lending Library with books, spoken word recordings, videos, DVDs, CDs and scores available for loan. The Barbican is a world-class arts and learning organisation, and is the largest performing arts centre in Europe. With a wide range of audiences over 1.5 million visitors pass through every year, and in 2012 there were many projects which formed part of the Cultural Olympiad and London 2012 Festival. The complex consists of the Barbican Hall, Barbican Theatre, Pit, Cinema One, Barbican Art Gallery, The Curve art gallery, a library, Lakeside Terrace, glasshouse Conservatory, conference facilities and 3 restaurants. The Barbican is home to the London Symphony Orchestra, the BBC Symphony Orchestra, The Academy of Ancient Music, Britten Sinfonia and Serious. The City of London Corporation is the owner, founder and principal funder of the Barbican Centre. •	Barbican Hall: capacity 1,949; home of the London Symphony Orchestra and the BBC Symphony Orchestra.